8th Annual Morgellons Medical Conference hosted by The Charles E. Holman Morgellons Disease Foundation announces new critical research to advance the understanding of the debilitating illness. 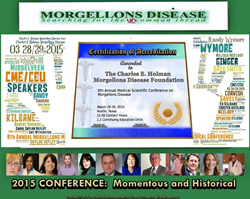 The Charles E. Holman Morgellons Disease Foundation (CEHMDF), a non-profit advocacy group for those suffering from the medical condition Morgellons Disease (MD), brought in attendees from the around the globe including researchers, medical professionals and patients for the 2015 conference titled “Searching for the Uncommon Thread.” The Scientific event, which took place March 28 & 29, was a formed to discuss new research to help understand the condition. Conference speakers included Randy S. Wymore, Ph.D., Director of Research at OSU-CHS-CIMD (Center for the Investigation of Morgellons Disease) and research assistant, Carol Saylor-Hefley; Marianne Middelveen, an Independent Researcher from Calgary, Alberta, Canada; and Eva Sapi, Ph.D. from the University of New Haven. Dr. Randy Wymore offered some candid, but prophetic comments concerning the media blitz about a possible connection of Morgellons disease to Joni Mitchell’s recent hospitalization: "Unfortunately, some media choose to focus on only the unusual Morgellons symptoms. Facts (research) in peer-reviewed journal papers and soon to be published results from OSU-CHS clearly show a bacterial infection in Morgellons patients." Ginger Savely, DNP provided attendees with a historical review of MD and discussion on diagnosis and treatment; Dr Eboni Cornish enlightened those at the conference with in-depth presentations surrounding medical management; Melissa McElroy, NP from San Francisco presented a classification system developed for MD. These knowledgeable medical providers, who are closely involved with the condition, provided a medical framework to help validate and standardize the diagnosis of Morgellons disease. Robert Giguere from GeneX Lab contributed exceptional insights concerning detection of the pathogen, Borrelia burgdorferi. The well-respected reference laboratory specializing in state-of-the-art clinical and research testing for Lyme disease and associated tick-borne diseases, is now also focusing on Morgellons disease. Finally, the psychological toll caused by MD was addressed by Stanford/Case Western Psychiatrist, Dr. Edward Kilbane and retired Georgia Pediatrician Dr. Greg Smith. "It is quite unfortunate Morgellons Disease has been associated with the psychiatric disorder Delusions of Parasitosis. Indeed, they are distinct entities," said Dr. Smith, CEHMDF Assoc. Dir. "It is sad that, rather than approaching this disorder as something a bit different, it immediately was placed in the delusional spectrum. The serious systemic symptoms were dismissed as well," concluded Dr. Smith. The Charles E. Holman Morgellons Disease Foundation is a 501©3 nonprofit committed to advocacy and philanthropy in the battle against MD. An all-volunteer organization based in Austin, TX, the Holman foundation is the singularly recognized authority on Morgellons disease and stands alone in funding scientific research of this condition. Executive Director Cindy Casey-Holman, RN leads the foundation, named for Charles E. Holman, a pioneer in the fight against MD. Currently, there exist neither grants, nor any other public or private funding sources to support research for this disease. Event proceeds will be used to further this research, education and awareness. All donations are tax deductible. To learn more about Morgellons disease go to MorgellonsDisease.org . The conference was recorded for educational purposes. DVDs will be available soon through the foundation’s website. 1. Savely VR, Stricker RB. Morgellons disease: analysis of a population with clinically confirmed microscopic subcutaneous fibers of unknown etiology. Clin Cosmet Investig Dermatol. 2010;3:67–78. 4. http://www.cdc.gov,.http://www.cdc.gov/unexplaineddermopathy/docs/external_peer_review.pdf - .N.p., 2015. Web. 7 Apr. 2015.